(2010). Coccidioidomycosis. Iowa, Center for Food Security and Public Health, Iowa State University: 9 pp. (2010). "ERRATUM: SKIN LESIONS ASSOCIATED WITH DEMODEX SP. 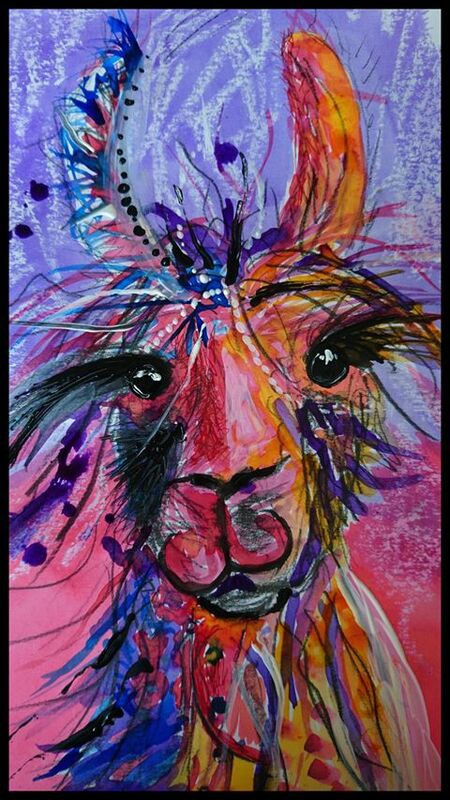 IN A LLAMA (LAMA PERUANA)." Journal of Zoo and Wildlife Medicine 41(3): 576-576. (2010). "Proceedings of the Annual Conference of the Society for Theriogenology, Seattle, Washington, USA, 31 August-5 September 2010." Clinical Theriogenology 2(3): 145-403. Abbeele, A. v. d., S. d. Clercq, A. d. Ganck, V. d. Corte, B. v. Loo, S. H. Soror, V. Srinivasan, J. Steyaert, J. Vandekerckhove and J. Gettemans (2010). "A llama-derived gelsolin single-domain antibody blocks gelsolin-G-actin interaction." Cellular and Molecular Life Sciences 67(9): 1519-1535. Aller, J. F., A. K. Cancino, G. E. Rebuffi and R. H. Alberio (2010). "Effect of estradiol benzoate used at the start of a progestagen treatment on superovulatory response and embryo yield in lactating and non-lactating llamas." Animal Reproduction Science 119(3/4): 322-328. Alstine, W. G. v. and I. Mitsui (2010). "Sudden death associated with hypertrophic cardiomyopathy in an alpaca (Llama pacos)." Journal of Veterinary Diagnostic Investigation 22(3): 448-450. Anderson, D. E., C. G. Couto and M. Oglesbee (2010). "Granulosa theca cell tumor with erythrocytosis in a llama." Canadian Veterinary Journal 51(10): 1157-1158, 1160. Antonini, M. (2010). "Hair follicle characteristics and fibre production in South American camelids." Animal 4(9): 1460-1471. Apichela, S. A., J. N. Valz-Gianinet, S. Schuster, M. A. Jiménez-Díaz, E. M. Roldán-Olarte and D. C. Miceli (2010). "Lectin binding patterns and carbohydrate mediation of sperm binding to llama oviductal cells in vitro." Animal Reproduction Science 118(2/4): 344-353. Bianchi, C. P., L. Sahlin, A. Meikle, B. Masironi, M. V. Cavilla and M. A. Aba (2010). "Endometrial population of oestrogen receptors alpha and beta and progesterone receptors A and B during the different phases of the follicular wave of llamas (Lama glama)." Reproduction in Domestic Animals 45(5): 872-880. Bornstein, S. and K. d. Verdier (2010). "Some important ectoparasites of alpaca (Vicugna pacos) and llama (Lama glama)." Journal of Camelid Science 3: 49-61. Bornstein, S. and K. d. Verdier (2010). "The South American camelids." Svensk Veterinärtidning 62(5): 37-42. Carretero, M. I., M. Miragaya, M. G. Chaves, M. Gambarotta and A. Agüero (2010). "Embryo production in superstimulated llamas pre-treated to inhibit follicular growth." Small Ruminant Research 88(1): 32-37. Cavilla, M. V., C. P. Bianchi and M. A. Aba (2010). "Oestradiol-17β plasma concentrations after intramuscular injection of oestradiol benzoate or oestradiol cypionate in llamas (Lama glama)." Acta Veterinaria Scandinavica 52(13): (11 February 2010). Chávez R, A., A. Sato S, M. Navarrete Z and J. Cisneros S (2010). "Macroscopic anatomy of the mammary gland in the Ilama (Lama glama)." Revista de Investigaciones Veterinarias del Perú (RIVEP) 21(1): 1-10. Concha-Albornoz, I. (2010). Anatomy of the osseous external acoustic meatus, middle ear and surrounding soft tissue in llamas (Lama glama), Oregon State University. Conway, J. O., L. J. Sherwood, M. T. Collazo, J. A. Garza and A. Hayhurst (2010). "Llama single domain antibodies specific for the 7 botulinum neurotoxin serotypes as heptaplex immunoreagents." PLoS ONE(No.January): e8818. Coster, M. E., J. A. Ramos-Vara, R. Vemulapalli, J. Stiles and S. G. Krohne (2010). "Coccidioides posadasii keratouveitis in a llama (Lama glama)." Veterinary Ophthalmology 13(1): 53-57. Deschacht, N., K. d. Groeve, C. Vincke, G. Raes, P. d. Baetselier and S. Muyldermans (2010). "A novel promiscuous class of camelid single-domain antibody contributes to the antigen-binding repertoire." Journal of Immunology 184(10): 5696-5704. Donabedian, S. M., M. B. Perri, N. Abdujamilova, M. J. Gordoncillo, A. Naqvi, K. C. Reyes, M. J. Zervos and P. Bartlett (2010). "Characterization of vancomycin-resistant Enterococcus faecium isolated from swine in three Michigan counties." Journal of Clinical Microbiology 48(11): 4156-4160. Duncanson, G. (2010). "Facing camelid postmortems: preparation, action, results." Veterinary Times 40(12): 26-27. Eo, K.-Y., D. Kwak, T. Shin, Y.-G. Yeo, K.-Y. Jung, S.-C. Kwon, S. Kim and O.-D. Kwon (2010). "SKIN LESIONS ASSOCIATED WITH <em>DEMODEX</em> SP. IN A LLAMA <em>(LAMA PERUANA)</em> [corrected title: SKIN LESIONS ASSOCIATED WITH <em>DEMODEX</em> SP. IN A LLAMA <em>(LAMA GLAMA)</em>]." Journal of Zoo and Wildlife Medicine 41(1): 178-180. Estrada CÃƒÂ¡rdenas, B. r. E., D. Meyran and . (2010). Homme et chien dans Agua quemada de Carlos Fuentes, Hasta no verte JesÃƒÂºs mÃƒÂo d'Elena Poniatowska, El llano en llamas de Juan Rulfo et El dÃƒÂa que fuimos perros d'Elena Garro du simil ÃƒÂ l'allÃƒÂ©gorie, University of Perpignan. Fagiolini, M., R. P. Lia, P. Laricchiuta, P. Cavicchio, R. Mannella, C. Cafarchia, D. Otranto, R. Finotello and S. Perrucci (2010). "GASTROINTESTINAL PARASITES IN MAMMALS OF TWO ITALIAN ZOOLOGICAL GARDENS." Journal of Zoo and Wildlife Medicine 41(4): 662-670. Fernández, G. P., Á. Segura, M. Herrera, W. Velasco, G. Solano, J. M. Gutiérrez and G. León (2010). "Neutralization of Bothrops mattogrossensis snake venom from Bolivia: experimental evaluation of llama and donkey antivenoms produced by caprylic acid precipitation." Toxicon 55(2/3): 642-645. Fleis, R. I. and D. W. Scott (2010). "The microanatomy of healthy skin from alpacas (Vicugna pacos)." Journal of Veterinary Diagnostic Investigation 22(5): 716-719. Fowler, M. E. M. a., P. W. Bravo and ebrary Academic Complete (2010). Medicine and surgery of camelids : [llama, alpaca, vicunÌƒa, guanaco, dromedary & Bactrian camels]. Ames, Iowa, Wiley-Blackwell. Fugal, R. A., V. J. Anderson and B. Roundy (2010). "Exotic grass and shrub production evaluation and llama preference on the Bolivian Altiplano." Small Ruminant Research 94(1): 150-160. Fugal, R. A., V. J. Anderson and B. Roundy (2010). "Exotic grass and shrub production evaluation and llama preference on the Bolivian Altiplano." Small Ruminant Research 94(1/3): 150-160. Gabor, M., L. J. Gabor, S. Mukesh, M. Booth and R. Reece (2010). "Chronic myositis in an Australian alpaca (Llama pacos) associated with Sarcocystis spp." Journal of Veterinary Diagnostic Investigation 22(6): 966-969. Garay, R. and M. Henriquez (2010). "Fire performance of boards and pine radiata wood with and without flame retardant paint." Maderas: Ciencia y Technologia 12(1): 11-24. GarcÃƒÂa LÃƒÂ³pez, M. n. (2010). Desarrollo de nuevas metodologÃƒÂas para la determinaciÃƒÂ³n de plastificantes y retardantes de llama organofosforados y sus derivados en muestras medioambientales memoria para optar al grado de Doctor en QuÃƒÂmica, Universidade de Santiago de Compostela, Servizo de PublicaciÃƒÂ³ns e Intercambio CientÃƒÂfico. Gerken, M. (2010). "Relationships between integumental characteristics and thermoregulation in South American camelids." Animal 4(9): 1451-1459. Gionfriddo, J. R. (2010). "Ophthalmology of South American camelids." Veterinary Clinics of North America, Food Animal Practice 26(3): 531-555. Giuliano, S., M. Carretero, M. Gambarotta, D. Neild, V. Trasorras, M. Pinto and M. Miragaya (2010). "Improvement of llama (Lama glama) seminal characteristics using collagenase." Animal Reproduction Science 118(1): 98-102. Gomes, M. J. P. (2010). Paratuberculosis in Brazil: challenges and opportunities. Santiago, World Buiatrics Association: unpaginated. Hunter, D. (2010). Brucellosis and Johne's disease in cervids and bovids. Gainesville, The North American Veterinary Conference: 309-311. Jarvinen, J. A. and J. M. Kinyon (2010). "Preputial microflora of llamas (Lama glama) and alpacas (Vicugna pacos)." Small Ruminant Research 90(1/3): 156-160. Johnson, L. W. (2010). Camelid committee conception. Gainesville, The North American Veterinary Conference: 346-347. Johnson, L. W. (2010). Keeping small ruminant field anesthesia simple. Gainesville, The North American Veterinary Conference: 345. Kaufmann, C., M. L. Meli, R. Hofmann-Lehmann and P. Zanolari (2010). "First detection of "Candidatus mycoplasma haemolamae" in South American Camelids of Switzerland and evaluation of prevalence." Berliner und Münchener Tierärztliche Wochenschrift 123(11/12): 477-481. Lette, K.-M. a. (2010). The llama parlour. London, Bloomsbury. Lin, T. Y., A. Hamberg, R. Pentecost, M. Wellman and P. Stromberg (2010). "Mast cell tumors in a llama (Lama glama)." Journal of Veterinary Diagnostic Investigation 22(5): 808-811. Llamas, A. (2010). "Fluid administration." Argos - Informativo Veterinario(No.119): 34, 35-36. Llamas, M. J., E. Prats and D. Rubiales (2010). "Durability of resistance to rust in sunflower: implications for resistance breeding." Ratarstvo i Povrtarstvo 47(2): 435-438. Long, P. O. (2010). Camelid herd health and husbandry - basics and how to communicate them. Gainesville, The North American Veterinary Conference: 362-364. Long, P. O. (2010). Cria care - how to deal with the normal and abnormal. Gainesville, The North American Veterinary Conference: 357-359. Long, P. O. (2010). Uterine torsion correction in alpacas - a field approach. Gainesville, The North American Veterinary Conference: 367. Lowe-Phelps, K. (2010). Yama, the Llama: Off to Bethlehem, Tate Publishing & Enterprises. Luppi, M. M., M. C. C. Malta, N. M. Ocarino, S. A. França and R. Serakides (2010). "Cutaneous angiomatosis in a llama (Lama glama)." Journal of Comparative Pathology 142(2/3): 223-227. Marcoppido, G., V. Parreño and B. Vilá (2010). "Antibodies to pathogenic livestock viruses in a wild vicuña (Vicugna vicugna) population in the Argentinean Andean Altiplano." Journal of Wildlife Diseases 46(2): 608-614. Markemann, A. and A. V. Zárate (2010). "Traditional llama husbandry and breeding management in the Ayopaya region, Bolivia." Tropical Animal Health and Production 42(1): 79-87. Markemann, A. D.-z.-w. D.-h. w. o. L.-E. (2010). "Functions and selection criteria for a llama population in the Bolivian Andes." Martin, J. M., B. A. Valentine and C. K. Cebra (2010). "Clinical, ultrasonographic, and laboratory findings in 12 llamas and 12 alpacas with malignant round cell tumors." Canadian Veterinary Journal 51(12): 1379-1382. McKenzie, E. C., B. Seguin, C. K. Cebra, M. L. Margiocco, D. E. Anderson and C. V. Löhr (2010). "Esophageal dysfunction in four alpaca crias and a llama cria with vascular ring anomalies." Journal of the American Veterinary Medical Association 237(3): 311-316. Meli, M. L., C. Kaufmann, P. Zanolari, N. Robert, B. Willi, H. Lutz and R. Hofmann-Lehmann (2010). "Development and application of a real-time TaqMan® qPCR assay for detection and quantification of 'Candidatus Mycoplasma haemolamae' in South American camelids." Veterinary Microbiology 146(3/4): 290-294. Mudry, M., M. Meylan, G. Regula, A. Steiner, R. Zanoni and P. Zanolari (2010). "Epidemiological study of pestiviruses in South American camelids in Switzerland." Journal of Veterinary Internal Medicine 24(5): 1218-1223. Navillod, F. V., M. D'Ottavio, L. Domenis, V. Botti, S. Robetto, M. Mancini, W. Mignone, A. Bertolla, M. Ragionieri, G. Savini, R. Orusa and C. Guidetti (2010). Case of seropositivity. From BTV 8 in a llama bred in Valle d'Aosta. Parma, Società Italiana di Diagnostica di Laboratorio Veterinaria (SIDiLV): 310-311. Nielsen, M. O., E. Tejada, V. G. Christensen and L. Nielsen (2010). Adaptive metabolic responses in sheep, goats and llama when fed grass based diets differing in protein content. Wageningen, Wageningen Academic Publishers: 507-508. Nielsen, M. O., E. Tejada, A. Chwalibog, A. H. Tauson and L. Nielsen (2010). Digestive efficiency, metabolism of nitrogen and methane emission in sheep, goats and llamas fed grass based diets differing in protein content. Wageningen, Wageningen Academic Publishers: 497-498. Oancea, S., G. Pavel and A. V. Oancea (2010). "On the shape of the erythrocytes from some herbivore mammals." Lucrări Științifice - Medicină Veterinară, Universitatea de Științe Agricole și Medicină Veterinară "Ion Ionescu de la Brad" Iași 53(12(1)): 121-126. Parisien, A. (2010). Surexpression chez Escherichia coli de l'anticorps ÃƒÂ domaine simple ToxA5.1 provenant du lama et ayant pour cible l'entÃƒÂ©rotoxine A produite par Clostridium difficile = Over-expression in Escherichia coli of the ToxA5.1 llama single domain antibody targeting Clostridium difficile enterotoxin A.
Reed, K. M., M. M. Bauer, K. M. Mendoza and A. G. Armién (2010). "A candidate gene for choanal atresia in alpaca." Genome 53(3): 224-230. Reed, S. K. and S. A. Semevolos (2010). "Molecular and histologic evaluation of idiopathic hyperextension of the metacarpophalangeal and metatarsophalangeal joints in adult llamas." American Journal of Veterinary Research 71(2): 211-215. Riveros, J. L., G. Schuler, C. Bonacic, B. Hoffmann, M. G. Chaves and B. Urquieta (2010). "Ovarian follicular dynamics and hormonal secretory profiles in guanacos (Lama guanicoe)." Animal Reproduction Science 119(1/2): 63-67. Ruiz-Velazco, J. M. J., A. Hernández-Llamas, V. M. Gomez-Muñoz and F. J. Magallon (2010). "Dynamics of intensive production of shrimp Litopenaeus vannamei affected by white spot disease." Aquaculture 300(1/4): 113-119. Saun, R. v. (2010). Nutritional unbalances in camelids. Santiago, World Buiatrics Association: unpaginated. Schlögl, C., S. Bork-Mimm and K. Pfister (2010). "Investigation on the infestation of South American camelids with external parasites." Tierärztliche Praxis. Ausgabe G, Grosstiere/Nutztiere 38(5): 293-296. Shinde, S. B., S. D. Hagawane, D. N. Rajguru and G. P. Dhage (2010). "Tuberculosis in wild animals." Veterinary Practitioner 11(1): 76-79. Sluijs, L. v. d., M. Gerken and H. Preuschoft (2010). "Comparative analysis of walking gaits in South American camelids." Journal of Zoology 282(4): 291-299. Stein, L. T., R. R. Rech, L. Harrison and C. C. Brown (2010). "Immunohistochemical study of rabies virus within the central nervous system of domestic and wildlife species." Veterinary Pathology 47(4): 630-633. Stockland, P. M. and T. Ouren (2010). In the Llama Yard, Magic Wagon. Sumar, J. (2010). Nutrition in camelids. Santiago, World Buiatrics Association: 343-357. Tornquist, S. J., L. Boeder, C. Rios-Phillips and V. Alarcon (2010). "Prevalence of Mycoplasma haemolamae infection in Peruvian and Chilean llamas and alpacas." Journal of Veterinary Diagnostic Investigation 22(5): 766-769. Trasorras, V., M. G. Chaves, D. Neild, M. Gambarotta, M. Aba and A. Agüero (2010). "Embryo transfer technique: factors affecting the viability of the corpus luteum in llamas." Animal Reproduction Science 121(3/4): 279-285. Twomey, D. F., W. A. Cooley and R. Wood (2010). "Confirmation of the chewing louse, Bovicola breviceps, in a British llama (Lama glama) herd." Veterinary Record 166(25): 790-791. Twomey, D. F., T. R. Crawshaw, J. E. Anscombe, J. E. F. Barnett, L. Farrant, L. J. Evans, W. S. McElligott, R. J. Higgins, G. S. Dean, H. M. Vordermeier and R. d. l. Rua-Domenech (2010). "Assessment of antemortem tests used in the control of an outbreak of tuberculosis in llamas (Lamaglama)." Veterinary Record 167(13): 475-480. Tynes, V. V. (2010). Behavior of exotic pets. Chichester, West Sussex, Wiley-Blackwell. Valdés, A. J., C. Medina Martínez, M. I. Guerra Romero, B. Llamas García, J. M. Morán del Pozo and A. Tascón Vegas (2010). "Re-use of construction and demolition residues and industrial wastes for the elaboration or recycled eco-efficient concretes." Spanish Journal of Agricultural Research 8(1): 25-34. Varney, K. (2010). "Quarterly review of diagnostic cases - April to June 2010." Surveillance (Wellington) 37(3): 23-30. Varney, K. (2010). "Quarterly review of diagnostic cases - January to March 2010." Surveillance (Wellington) 37(2): 36-42. Ven, S., S. Schauvliege, C. Gadeyne, M. Gozalo-Marcilla, S. Segaert and F. Gasthuys (2010). "Anesthesia with α2 agonists in the llama: review and research." Vlaams Diergeneeskundig Tijdschrift 79(4): 269-274. Wilson, P. J., E. H. Oertli, P. R. Hunt and T. J. Sidwa (2010). "Evaluation of a postexposure rabies prophylaxis protocol for domestic animals in Texas: 2000-2009." Journal of the American Veterinary Medical Association 237(12): 1395-1401. Zanolari, P. (2010). "Parasite control in South American camelids." Forum Kleinwiederkäuer/Petits Ruminants(No.12): 6-14. Zanolari, P., L. Bruckner, R. Fricker, C. Kaufmann, M. Mudry, C. Griot and M. Meylan (2010). "Humoral response to 2 inactivated bluetongue virus serotype-8 vaccines in South American camelids." Journal of Veterinary Internal Medicine 24(4): 956-959. Zanolari, P., V. Chaignat, C. Kaufmann, M. Mudry, C. Griot, B. Thuer and M. Meylan (2010). "Serological survey of bluetongue virus serotype-8 infection in South American camelids in Switzerland (2007-2008)." Journal of Veterinary Internal Medicine 24(2): 426-430.